What happens when you take a $75,000 anesthesia machine from a hospital in the developed world and drop it in a 3rd world hospital that suffers an average of 16 power outages a month and has no spare parts? What seems like a really cool charitable donation to a needy 3rd world country is not only useless … is downright dangerous. It is NOT GOOD when your anesthesia machine stops working while your belly is wide open. The machines break down and end up in a back room of the hospital in a First World Medical Technology Graveyard. An anesthesia machine that kills patients because of the physical realities of operating in third world countries is a danger to the local people … just the opposite of what we are intending by donating our tech. It turns out that showering the 3rd world with our medical innovations hurts rather than helps. Fortunately, when it comes to real world medical innovations … this necessity is the mother of invention. How’s this for medical innovations … a Universal Anesthesia Machine that doesn’t need power … and can be fixed with nothing more than a hex wrench and screwdriver. Sure it can use power when it is available … and it does not stop working when the power goes out. The patient does not wake up … or die. As medical innovations go, the universal anesthesia machine … makes me a happy md for sure. 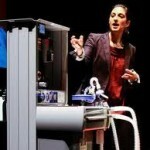 Below is the full TED-MED Universal Anesthesia Machine Video Presentation by Erica Frenkel. And here’s the link to video on the TED site.